Thomas Wade Brennaman (born September 12, 1963) is an American television sportscaster. He is the son of Cincinnati Reds radio sportscaster Marty Brennaman. After graduating in 1982 from Cincinnati's Anderson High School Thom attended Ohio University, where he was president of the Beta Kappa Chapter of Beta Theta Pi fraternity. He entered college uncertain of whether to follow in his father's footsteps and become a broadcaster. While at Ohio he joined station WATH, developing his own love for radio. After graduating in 1986, Brennaman worked as a sports reporter/anchor for WLWT-TV, the NBC affiliate in Cincinnati. During this same period, he worked as the television play-by-play announcer for the Cincinnati Reds alongside Major League Baseball Hall of Famer Johnny Bench. In the early 1990s he did Chicago Cubs broadcasts, alternating with Hall of Fame broadcaster Harry Caray between television and radio. In 1994, he was hired by Fox Sports to call the network's National Football League and Major League Baseball telecasts. Brennaman has also called college football and college basketball for FOX as well. He served as the first television voice for the Arizona Diamondbacks from 1998 to 2006 and left after the 2006 season to join his father Marty in Cincinnati. In 2006, Brennaman was named as Fox's lead play-by-play announcer for the Bowl Championship Series. In addition to calling the BCS National Championship Game, Brennaman called the 2007 Fiesta Bowl. On both broadcasts, Brennaman worked with former University of Wisconsin–Madison head coach Barry Alvarez (only in 2007), and former University of Tennessee defensive back and current broadcaster Charles Davis. Brennaman also called the 2008 Sugar Bowl and the 2009 Orange Bowl. Additionally, the Big Ten Network named Brennaman as its lead play-by-play announcer for college football games for two seasons beginning in September 2007. He would return to calling NFL games for Fox full-time in 2009 (Prior to this, Brennaman worked NFL games for FOX previously from 1994-1997, 1999-2000 and 2004-2008 as a regular and/or fill-in announcer), working primarily with Brian Billick (and later, on David Diehl, Charles Davis, and Chris Spielman) but also filling in as lead announcer while Joe Buck did the MLB playoffs. However, in 2018, he will be filling in for Kenny Albert on the #3 team alongside with Troy Aikman and Erin Andrews for the Packers-Rams game. Prior to that, Brennaman had been the voice of the Cotton Bowl Classic on Fox from 2000 to 2006. Brennaman, along with Brian Billick, Laura Okmin, and Chris Myers called the 2012 NFC Divisional Playoff matchup between the Seattle Seahawks and the Atlanta Falcons instead of Kenny Albert, Daryl Johnston, and Tony Siragusa. This was Brennaman's first time calling an NFL playoff game, although Brennaman and Billick called the 2011 Pro Bowl along with Terry Bradshaw and sideline reporters Tony Siragusa and Jay Glazer. On October 3, 2006, Cincinnati Reds owner Robert Castellini hired Brennaman through the 2010 season to announce 45 Reds games on FS Ohio television and 45 games on the Cincinnati Reds Radio Network, flagship station being 700 WLW. His father's contract with the Reds was set to expire after the 2010 season. Currently, both Thom and Marty continue to broadcast for the Cincinnati Reds. Brennaman was a part of Fox Sports' #2 baseball broadcast team from the beginning of Fox's involvement in Major League Baseball in 1996 until 2015. He has teamed with Bob Brenly, Steve Lyons, Joe Girardi, and Eric Karros. In this capacity, he called play-by-play for numerous postseason games from 1996 until 2006. From 2007 to 2013, the #2 team was not given any postseason assignments due to Fox not holding the rights to any concurrent postseason series. In 2014, Brennaman and Karros began to split the #2 role with Matt Vasgersian and John Smoltz. Fox also returned to using multiple broadcast teams in the postseason that year, however, Brennaman and Karros were passed over in favor of Vasgersian and Smoltz for the playoff assignment. In 2015, Matt Vasgersian and Smoltz took over the role full-time, with Brennaman pretty much ending his active MLB on FOX role. Brennaman will eventually move over to the Reds broadcasts full-time (except when he's working the NFL on FOX). 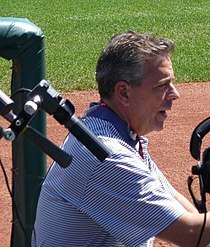 Brennaman has contributed voice-over work for video games Microsoft Baseball 2001, All-Star Baseball 2002, and All-Star Baseball 2003–2005 for GameCube, PlayStation 2 and Xbox. He has also done college basketball announcing for CBS Radio and Fox Sports Net cable. He is also a spokesman for CBTS, a Cincinnati Bell company, in television commercials. He also called basketball games for the Cincinnati Bearcats and Fox College Hoops. This page was last edited on 14 April 2019, at 19:43 (UTC).